Our site amenities not only enhance your outdoor recreation space, but they build a sense of belonging around an enjoyable experience. At UltraSite we take pride in providing communities the opportunity to enjoy life’s intermissions – a slight pause from a busy lifestyle. UltraSite’s brands of site amenities, shades, shelters, dog parks and outdoor fitness products, are the superior choice that provide a low maintenance, durable solution for any outdoor recreation location. We have been standing behind our products for over 15 years so that you can watch the sunrise, grill out with your family, or just have a nice place to relax while the kids are playing. We hope that UltraSite can join you as you build your next intermission. 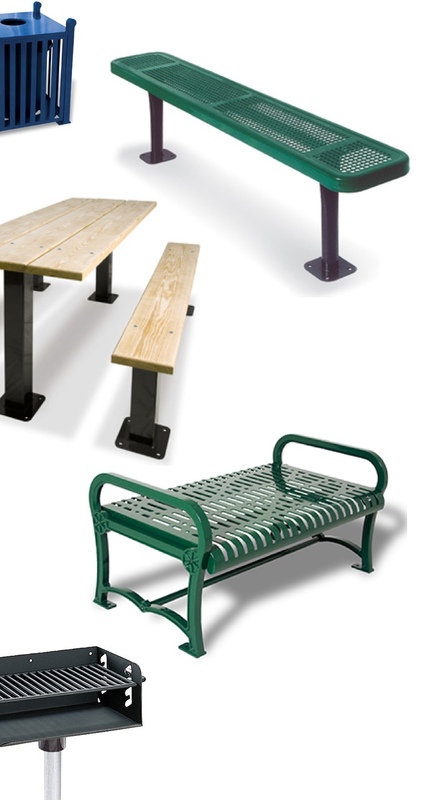 Our thermoplastic line of tables, benches and trash receptacles has been expanded and is an excellent example of our commitment to manufacture the finest “state-of-the-art” products available. UltraSite delivers pressure treated wooden products with ACQ, a more “environmentally friendly” product. UltraSite also provides 100% recycled plastic lumber for many applications. The steel products used in our line are supplied by Allied Tube which delivers the industry’s finest protective coating. UltraSite further enhances the durability by applying a superior powder coated paint. 100% RECYCLED PLASTIC is part of the UltraSite Advantage that provides responsible resource management. We focus on reducing pollution and waste production to save the environment for future generations. Have a specific question you need answered? Drop us a line and a representative will touch base with you shortly!